This movie is being released on video in color or B&W because the studio thinks people are too stupid to get a B&W movie. Don't prove them right. Go out of your way to get it in B&W, because the B&W photography is unbelievably fantastic. Do not rent it in pan-&-scan either, for the same reason. Find it in letterbox. 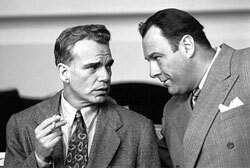 In their deeply ironic yet habitually impish, beautifully black-and-white 1950s drama "The Man Who Wasn't There," writing-directing brothers Joel and Ethan Coen have revived the dry, laconic spirit of prototypical film noir and applied it to the life of an everyday barber. True, he's an everyday barber mixed up in the blackmail and murder of his cheating wife's boss and lover. But he's such an obscure, detached shadow of a man that the whole mess feels almost workaday mundane. You see, it's not his wife's affair that motivates the man. "It's a free country," he says in the movie's soporific, quietly sonorous running voice-over. It's the fact that he figures blackmail is a good way to get $10,000 out of the boyfriend so he can invest in some new-fangled invention called dry cleaning. The barber, named Ed Crane, is played with brilliant reserve by Billy Bob Thornton, who has the most subtly expressive, heavily crevassed film noir face to smoke a dangling cigarette since Humphrey Bogart. He hardly registers a distinguishable emotion in 116 minutes, yet his passive soul fills the screen as Ed's plans go badly awry. The boyfriend (James Gandolfini), manager of a department store owned by his pinched, crow-faced heiress wife, works out who's blackmailing him and comes after Ed -- who kills him in self-defense. Unexpectedly, Ed's brusque, exasperated wife (Frances McDormand), the store's accountant, is charged with the crime after the cops discover she'd helped cook the books so the blackmail could be paid. They think it's embezzlement and murder. On the advice of a small-time lawyer friend, Ed scrapes together enough money to hire a city slicker litigator (Tony Shalhoub, in an inspired performance of sheer arrogance) -- who decides, in one of those idiosyncratic and droll Coen Brothers twists, that he couldn't possibly sell Ed's true version of events to a jury and chooses to make something up instead. "The Man Who Wasn't There" is, of course, full of such oddball moments that lend the proceedings a deliciously dark wit without ever losing touch with the film's sober center. After tucking his drunken wife into bed one night, Ed's voice-over story of how they met is interrupted by a phone call that leads into Gandolfini's murder. After the killing, Ed returns home, sits back down on the bed and the voice-over resumes uninterrupted "...it was just a couple weeks later she suggested we get married...."
Besides their inborn talent for deftly balancing humor and drama, the Coens know their film noir. The story is made more suspenseful by the very fact that it unspools on Ed's stoical timetable. The cinematography (by the brilliant Roger Deakins, a frequent Coen collaborator) is amazingly vivid and crisp, full of dense shadows and the symbolic illustrations of Ed's emotional absenteeism (even his wardrobe blends in with every background). And the performances all have a starched, pithy potency that harks of the genre's sum and substance while finessing an indirect, wry incisiveness. In addition to having a perfect face for black-and-white film, Thornton is compellingly sympathetic yet dry, stilted and terse. Save his voice-over, Ed has at most 35 lines of dialogue in the whole picture. McDormand, with her wonderfully, humorously curt delivery, establishes her character's entire disposition in one word when she bolts upright at a church bingo game to churlishly snap "Bingo!" as if someone might try to cheat her of her victory. Gandolfini has an amazing breakdown scene after the blackmail note is delivered and before he realizes who's behind it, in which he has the audacity to ask Ed for advice, confessing to an affair but pretending it's with "nobody you know." Also well cast is Scarlett Johansson ("Ghost World") as the teenage daughter of a family friend whom Ed comes to see as a possible source of salvation. She projects an incongruously soulful indifference that's like a magnet to Ed's own hollowness. He doesn't have romantic designs on her -- although there is a flicker of desire somewhere deep behind his eyes. He wants to help her become a concert pianist because he thinks her melodious but mechanical and indifferent ivory tickling is the most beautiful sound he's ever heard. The only significant problem with "The Man Who Wasn't There" is exemplified in the way this relationship culminates. The Coens momentarily shatter the film's 1950s spell with a highly unlikely and gratuitous twist that would only appear in a movie made with modern sensibilities. Similar slips of authenticity appear throughout the picture, and they're jarring enough that it's easy to become distracted. I mean, is it really necessary for a businessman to come on to Ed for us to understand the character is gay?